That pretty well describes how Detroit became the largest U.S. city to file for bankruptcy protection this summer. 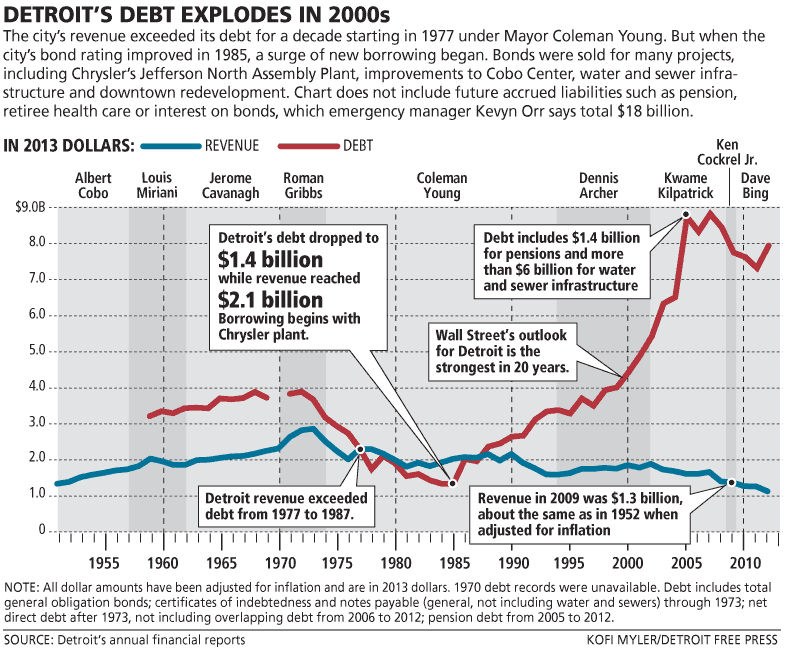 A stellar analysis of the city’s troubled financial history by the Detroit Free Press concluded that Detroit’s bankruptcy was the result of decades of poor decisions by city leaders — failure to trim payroll in the 1960s and 1970s as the city’s population and property-tax base began to fall, heavy borrowing to cover operating expenses in recent years, mismanagement of urban redevelopment projects, paying $1 billion in pension bonuses from 1985 to 2008, and much more. The paper distilled five decades’ worth of data into a series of graphics (of which this is just one) and accompanying text that clearly lay out a series of lost opportunities to avoid tumbling into a fiscal black hole.